One of the most helpful dental tools that you can own is your toothbrush. Knowing that, it might make you feel a little overwhelmed when you walk down the dental hygiene aisle at the store to pick out your next brush. However, after reading this helpful post from your local dentist in Greenfield, you’ll feel more confident than ever that you can choose your perfect toothbrush on your own. Learn more about how to shop for the best dental tools in this week’s blog post. 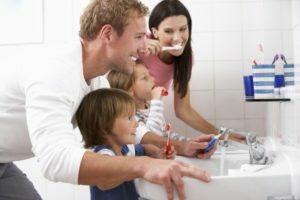 As mentioned above, it’s extremely important to have a great toothbrush because it’s one of the main tools in your dental hygiene routine at home. Here are some tips to help you choose your best fitting toothbrush. You may assume a firmer bristled toothbrush is better for scrubbing away dental plaque, but that’s not true. You could be scrubbing away your precious enamel, too! They are more flexible to get into hard-to-reach areas of the smile. Plus, they work to massage the gums. They keep the soft tissues strong by nurturing them, not hurting them! The right toothbrush can have different features for different people. After all, every mouth is different! Choose a toothbrush that fits comfortably in your hand. The handles are all different, providing different grooves and grips to enhance your brushing experience. Consider getting an electric toothbrush. Although both manual toothbrushes and electric toothbrushes can both get the job done, electric toothbrushes are just a bit more efficient when it comes to cleaning your teeth. With the rotating powered brush heads, you don’t have to do as much scrubbing. If you still have questions about what products and tools to purchase, your dentist is here to help you. After all, your dental team is here to be your partner in better oral health—even after you step outside your dental practice’s office. Simply give them a call for helpful advice while shopping for the best toothbrush or even stop by the office for hands on help. Above all else, don’t forget to visit your family dentist in Greenfield for preventive care—even after you upgrade your toothbrush. Contact your dentist to schedule your next appointment. Here at Advanced Dental Treatment Center, we want all patients to know that when you visit us, you have a team to rely on when you need dental care advice, recommendations, and services. Even when you want to optimize your care at home with better tools, we’re here to help. Give us a call today to get the assistance you need!